Red wine vinegar and oil dresses your salad without being harmful to your health, as many types of bottled salad dressing are. The Mediterranean diet emphasizes the use of vinegar and oil and studies have shown that people who eat this way are at a decreased risk of several health problems. This is likely due to the nutrients these two items contain. Not all oil is beneficial to your health, but using olive or canola oil for your dressings protects your heart. This is because both are mostly unsaturated fats, which control your cholesterol levels, reducing your risk of heart disease. These healthy fats also protect you from diabetes. Canola oil contains omega-3 fatty acids, a type of good fat that reduces your risk of having a heart attack. Both canola and olive oil are heart healthy fats, but they still contain calories, so eat them in moderation. Red wine vinegar is made from red wine, which contains antioxidants. These are compounds found in the grapes used to produce red wine and protect your body from damage to your cells that occurs when they are exposed to environmental toxins, such as smog and cigarette smoke. Olives are also a good source of antioxidants, and mixing olive oil with red wine vinegar offers protection from cancer and heart disease. Red wine vinegar has an intense flavor that pairs well with the flavor of oil, including olive and canola varieties. This means you can use a little less oil, cutting fat and calories from your dressing, while still enjoying the flavor that the combination offers. Creating your own dressing is a good way to do this, as many commercially prepared ones contain more oil than vinegar. 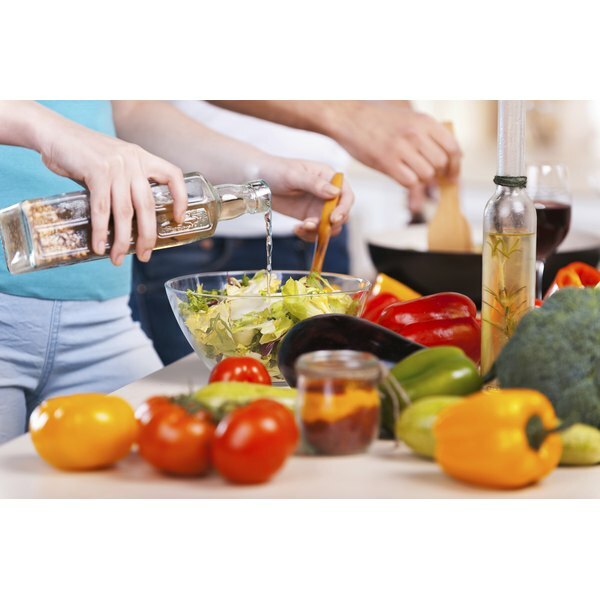 Two tablespoons of vinegar and oil dressing contain about 31 mcg of vitamin K, which may vary depending on the brand of red wine vinegar and type of oil you use. Adequate vitamin K intake is associated with healthy blood clotting, bone mineralization and cell growth. Adult males need 120 mcg of vitamin K each day and women should aim to get 90 mcg daily. Oil and vinegar dressing is quick and simple to make. Start by placing the vinegar in a bowl or salad dressing jar. Add any seasonings you like. Good choices include shallot, mustard, garlic or fresh thyme, dill or basil. Slowly whisk in a drizzle of oil until your dressing is thick enough to stick to your salad greens. Make only as much dressing as you need for safety and flavor reasons, recommends the University of Nebraska at Lincoln.